Will the real wife of Aaron Day please step forward??? Call the genealogy police! An impostor has posed for the wife of my 4th great grandfather, Aaron Day! Who the heck is Marion Harris? How on earth did she make it into SO MANY family trees??? Marion Harris was sneaky. She saw an opportunity and she joyfully GRABBED it! Yup, she knew that many genealogists despise empty blanks on their pedigree charts and family group sheets. 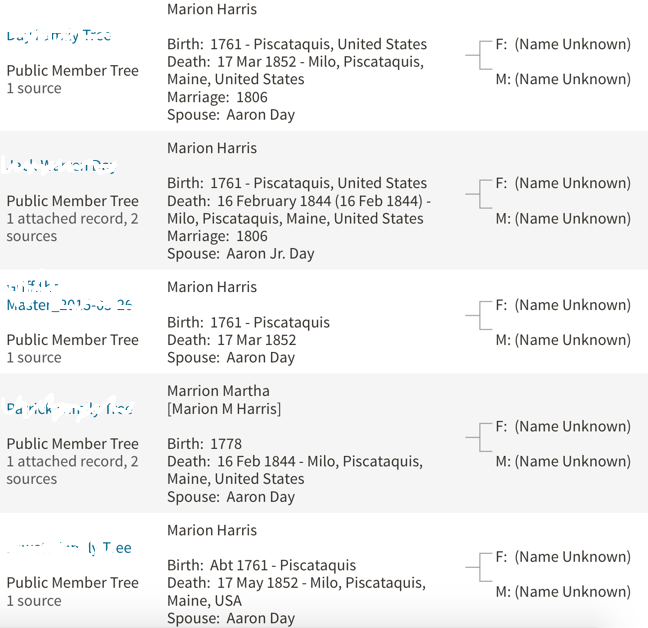 Somehow she planted the message in someone’s mind that Aaron Day had not married Martha, who is listed in Starks, Maine records as the mother of his three oldest children. Nope, of course it was Marion. And Marion needs a last name – so….let’s call her…Smith? No, too common! Mitchell? Naw….how about Harris? Yes! That has a good ring to it…Marion Harris!! While the above is all in jest, I have seriously wondered how the whole Marion Harris thing got started. She is listed in no fewer than 46 Ancestry.com public trees, and likely in a hoard of private ones as well. I have yet to find any record with her name on it that links her to Aaron Day, aside from the undocumented trees such as those listed above. 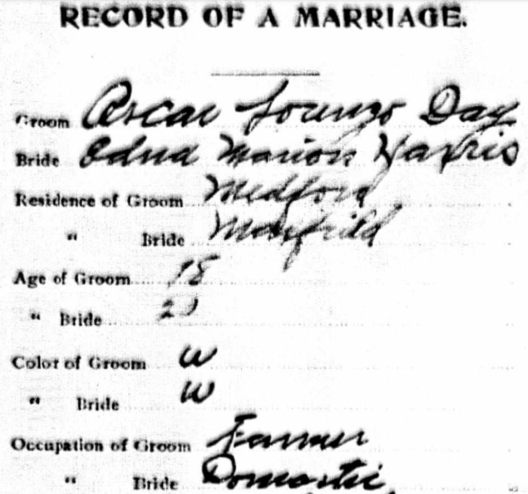 Shown above is a snapshot of a portion of the 20 July 1919 marriage record for Aaron Day’s great grandson, Oscar Lorenzo Day, who wed Edna Marion Harris in Lagrange, Penobscot County, Maine. Yes, I know I have such errors in my files too – and hopefully only in my oldest work, begun in the 1980s as my grandmother recited to me the names, dates and places she had in her memory, and which I dutifully transcribed onto my Family Group Sheets. Now, if you’ll excuse me, I need to get back to finding the impostors in my own tree! This entry was posted on Saturday, September 19th, 2015 at 3:00 PM	and posted in Day. You can follow any responses to this entry through the RSS 2.0 feed. « “In Search of Our Ancestors” – two thumbs up!